Steven (Chicagoland, United States) on 9 January 2013 in Architecture and Portfolio. Golden Gate Bridge as captured from the Marin County side at Golden Gate State Park. Fog blankets San Francisco in the background. Very beautiful in B&W ! Excellent shot . Super in monochrome . Epic shot and love the mono treatment! Das sieht in B&W auch Fantastisch aus. Love this black and white, the viewing angle, the shadow of the bridge upon water. Excellent series of shots. Such a busy bridge ... in all types of weather! I miss her International Orange, but this is truly timeless in mono. 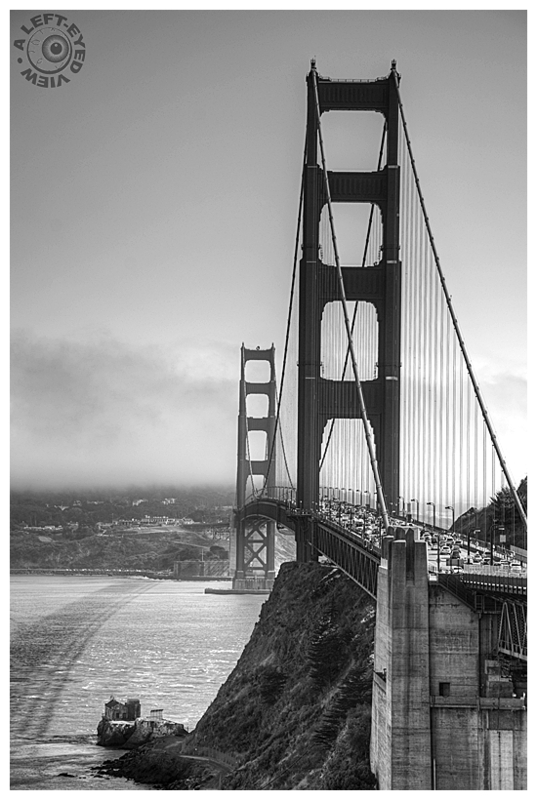 wow, the crispness and clarity in this bw capture of the iconic bridge are superb !!! Beautiful monochrome. I like seeing the view from the Marin County side. So often it is shown from the other side. ANother excellent POV> How busy that bridge is! I love the mist. Your image reminds me of the wonderfully detailed B&W films. Excellent framing and processing. Beautifully framed ... awesome b/w! Alright. I wondered when you would show us a version of the Bridge in b/w. Another winner from the old favorite - excellent presentation, Steven. Timeless. Great framing. You have captured a magnificent view, Steven! Definitely a great spot to photograph it from. I like this b&w timeless capture.. Very strong image - perfect in B&W. Hey Steven - These have been wonderful shots of the bridge...you founf the good spots too...Isn;t this a phenomenal city?? Bonjour Steven. Superb photo monochrome with excellent framing. Great capture. I lile it. Je vais te souhaiter de paser un excellent après-midi. Amicalement Antoine. A gorgeous image in that super B&W. The fog in the background lends a nice effect. Nice angle and quite good B&W work.